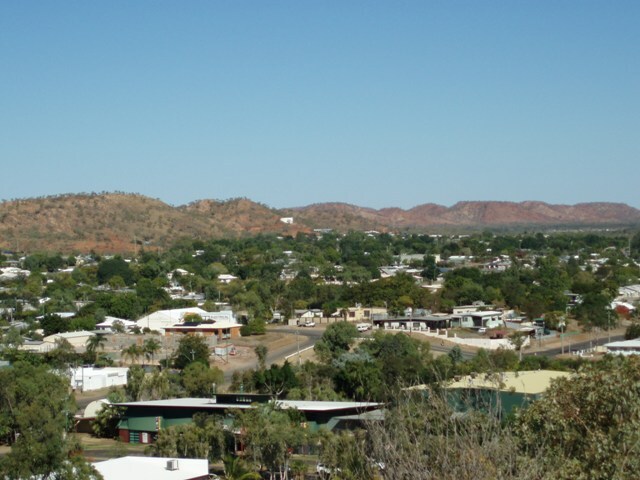 I was warmly welcomed by Paul and Shirley when I arrived in Mt Isa – they are the people I am house sitting for while they go off on their caravanning holiday. We spent 3 days together before they were packed and ready to leave. What luxury! A real bed, a warm shower every day, running water, a proper flushing toilet – and all the other things we take for granted. I don’t know how long I’ll be here as Paul and Shirley don’t know how much they’ll enjoy their nomadic lifestyle. As they left they said it could be 2 days, 2 weeks or 2 months! I spent my first few days settling in and finding my way around the town and then Laurance, a fellow Solo traveller, arrived. 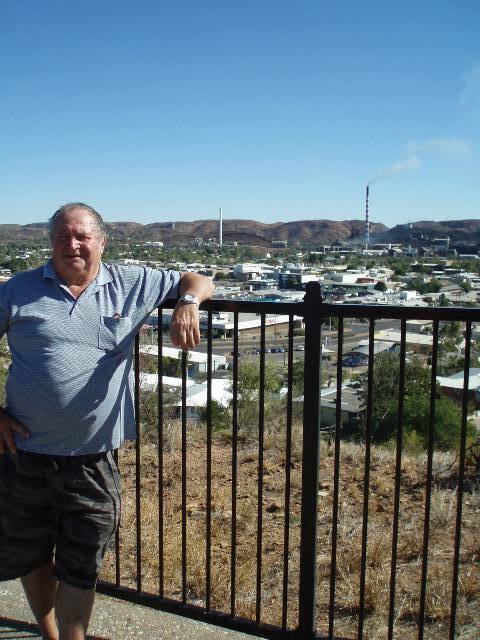 He was born in Mt Isa, although left here about 60 odd years ago and was taking the opportunity to re-visit some of his memories. 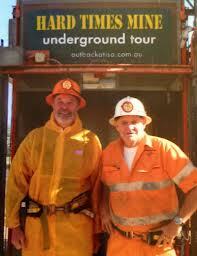 He’d left his campervan in Townsville and caught the train out – a 20 hour trip! I really enjoyed seeing the sights with him, and we drove all over the place as he tried to remember where he had lived and gone to school. 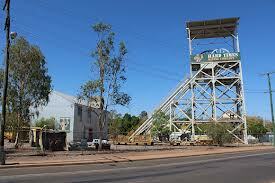 View of the mine at the ‘Outback at Isa’ centre. We all got a turn at the air drill, which drills out the holes for the explosives to blast through to the next stage of the mine. 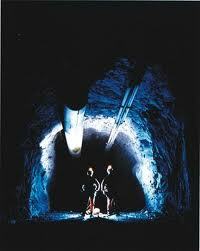 At 8 o’clock every morning and night you hear the real mine blast through to the next level. At one stage Bill got us all to turn our head lamps off and I have never experienced dark sooo dark. You couldn’t see your hand in front of your face. If this happens to a miner they have to stop where they are and sit down because their supervisor knows where each of them is in the mine and if they don’t come back to clock out he knows where to go to find them. It would be impossible to find your way out without a light. This was a fantastic experience and if anyone is heading out this way I would definitely recommend that you spend the $49 and do the tour. It lasts for about two and a half hours and was fascinating from start to finish. Our next trip was to the Underground Hospital, built during WW2 in case of bombing. 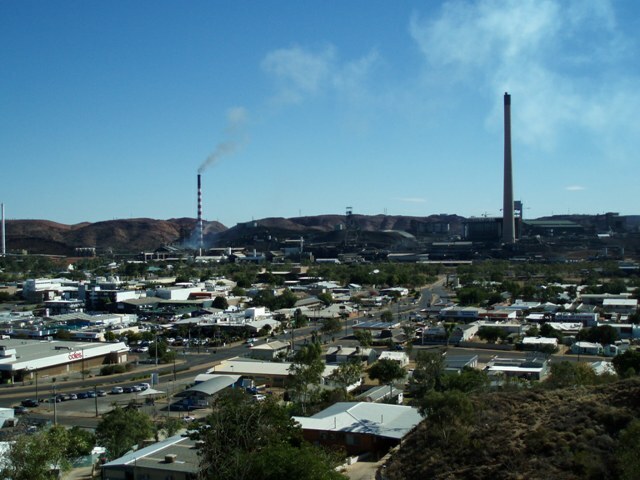 Mt Isa felt threatened because of the lead mining here that was supporting machinery and transport needed during the war and felt the mine could have been a target. This didn’t happen, and everyone forgot about the underground hospital until 1977 when they found it by accident when the hospital was being re-built and expanded. 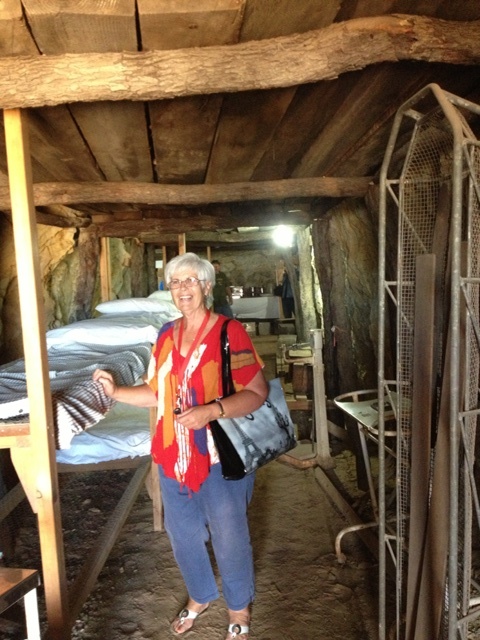 It was declared unsafe so sealed again for another 20 years and then some of the miners took to repairing the timbers and making the structure safe again. Everything that was in this hospital during the war was still there and intact, so has been left in place. Smaller items were recovered and there are bottles of chloroform and other medicines looking just as they must have in 1945. 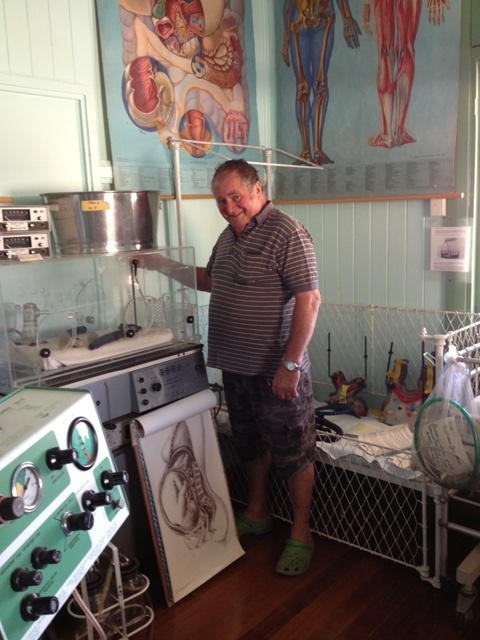 The hospital museum was part of the original hospital and this is where Laurance was born. He’s a little bigger now than he was when he left this maternity room way back then! 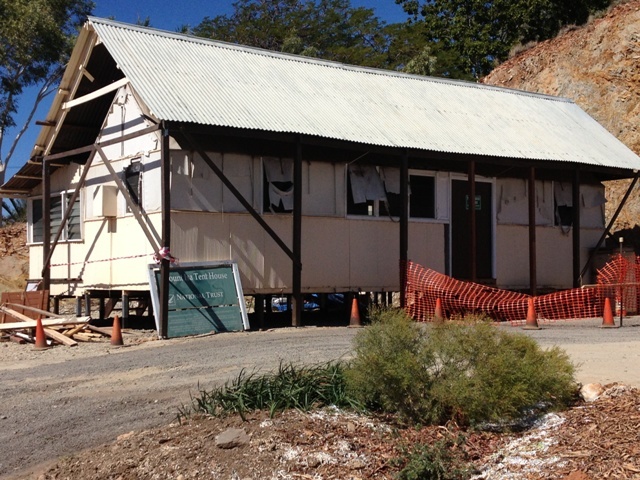 Recently they moved the last remaining tent house to the hospital grounds and are in the process of restoring it. Tent houses were built in the 1930’s to cater for all the miners coming to town and Laurance had lived in one of these as a child. It made it really interesting for me to visit these places because of Laurance’s connection and it was a bit like a treasure hunt discovering the stuff of his memories. I’m sure he also enjoyed his few days here, but I’m not so sure he was looking forward to those hard seats on the train for his 20 hour trip back to Townsville! I was glad I was going home to a hot shower and a comfortable bed. 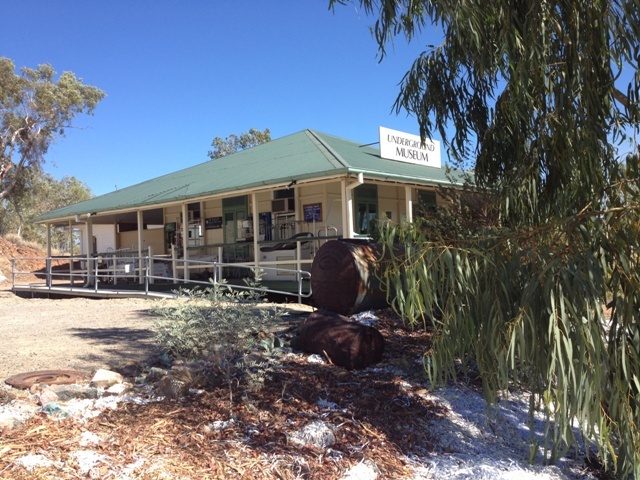 Categories: Camping, Travelling | Tags: bush poetry, camping, Hard Times Mine, house-sitting, Mt Isa, Mt Isa Lookout, Mt Isa Mine, tent house, Underground Hospital | Permalink.